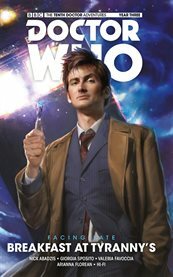 The item Doctor Who : the Tenth Doctor, Volume 1, issue 3.1-3.4, Revolutions of terror, writer: Nick Abadzis ; artist: Elena Casagrande ; colorist: Arianna Florean ; letters: Richard Starkings and Comicraft's Jimmy Betancourt ; editor: Andrew James, (electronic resource) represents a specific, individual, material embodiment of a distinct intellectual or artistic creation found in Richland Library. It's the start of a brand-new year for the Doctor, Gabby, and Cindy, and things are looking very different for the Tenth Doctor's TARDIS team! Dangerously different, in fact! Did the Doctor really abandon Gabby and Cindy back to their life on Earth - and why is he wandering homeless, without his TARDIS, on a mystifying alien world? The truth will dazzle, terrify, and entertain you! Renowned writer Nick Abadzis (Laika), with superstar artists Giorgia Sposito (Wonderland, Charmed) and Valeria Favoccia, pilots the TARDIS through the revelatory next chapter in the Doctor's ongoing story!